We've been making games for 6 years, for better or worse. Ben and/or Jerry: please don’t sue? This is a fun LD because I’m actually doing a collaborative effort for this jam; meaning I can focus entirely on graphics and music. The game is not named “House of 21 Corpses” but it would be funny if it was. Speaking of music, remember the Ludum Dare plug.dj? Well that closed down, but there’s now a room set up for Ludum Dare on dubtrack.fm with much the same function. Check it out! A postmortem implies a death. Which is accurate because this LD, my dreams have all died and I am fated to not even rank. My game is okay though! Anyway, as I’ll note multiple times in this postmortem, because I am very incompetent, I currently don’t have twenty ratings, so I am at risk of not getting ranked this LD. This would be very saddening, so please play my game. Seriously– I am desperate here! Anyway, what went wrong this LD? Well, I had finals. And Christmas vacation. And taking care of sick relatives. And (as of right now) coming down with said sickness, oooo-wah-ah-ah-ah. And uploading a version of the game without audio, then updating only to find four hours before the end of the jam that the updated download didn’t work. But what went wrong with the game itself? A couple things. Really goddamn hard. Like, even I had a problem beating the final level! And I made this game! The updated version of the game gives you additional lives, and counting typos and lives separately was done so that people could focus on staying alive in the later levels. It’s not very fun. The level itself stays consistent, with some new obstacles being added each level. Which means that there’s not too much variety in the game. Indeed, the best strategy may very well be to grab a Z and an X at the start of the game and wait for them to come down the text stream. Kind of obscure subject matter. Okay, here’s the plot of my game: There are thirteen gremlins trapped inside your keyboard that type messages for you, and one of those baker’s dozen of gremlins intends to hijack the White House with the assistance of a potential U.S. Poet Laureate. Do you know who Juan Felipe Herrera is? Do you know who Yi-Fen Chou is? If you answered yes, congratulations: you have better things to do with your life than play LD entries. On the other hand, there was some very good things about this jam! Super cool graphical style. The fusion between genuine C64-style pixel art, pictures of keyboards and graffiti spreads was came out very neat. 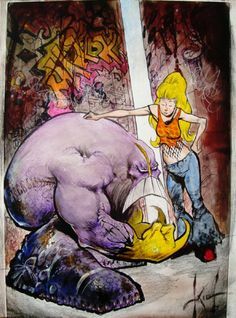 I was aiming to ape the art style of guys like Sam Kieth with the mixed-media stuff, and I think I succeeded. And the player character is totally adorable, come on! Her design– well, the angular glasses– were ripped off from a minor character in another Sam Kieth comic who I can’t find on Google Images, which means no one knows I’m ripping him off, which means that I invented her design all by myself and it sprung fully formed from my head like Athena. SICK SOUNDTRACK. Seriously, I love the music for this game. There’s a cute jazz rendition of Hail to the Chief done with authentic C64 style instrumentation that no one’s going to hear and that makes me cry. A large emphasis on (admittedly only semi-comprehensible) story. It’s a bizarre story and I hope people give me points for ambition. Anyway, it’s worth a try! Can’t go wrong with ZZXXX the Gremlin. I was away for most of the rating period and didn’t really get a chance to play any LD games, and as a result I’m five rankings short from making the final rankings. I rather liked my game (and will be typing up a postmortem shortly), and I’ve finally uploaded a version with working audio (six hours before the ranking period ends but who cares right?). If you enjoy C64 games or snarky humor about liberal arts majors and so-bad-it’s-good-but-mostly-it’s-just-bad poetry, please give it a whirl! Like animals entranced, my mestiza sisters shriek into heaven. Yes, this is still the C64-ish game I gave screenshots of earlier. Well this looks like s***! Guess what this game is about. No, really, guess. Once again, I must promote the LD plug.dj, where you and your fellow jammers can share music while you make your game! Any style of music is welcome. Now, about Spidermom. We’re closer to a straightforward gameplay style now, but not close enough. I’m most concerned about the graphics– the spidermom is literally white here, but that’s just a placeholder graphic. I need to find something that’ll work better! Black with white outlines? Ain’t she cute? Movement is a bit slow since you have to control eight limbs at once, so I’ll cut that down to six (the spidery legs stay, the arm legs go). But she really is precious. I’ll only be able to do the jam for ~24 hours because of real-life commitments, but that should be enough time to make something. Instead of listing my tools, here’s a joke for you: who is the official Ludum Dare rapper? That joke only works if you pronounce it da-RE. Uh, here’s a second joke: what was Dr. Dare’s groundbreaking album? That wasn’t very good either, but give me credit… I only had forty-eight hours! Ha!!! October Challenge: Let’s Finish Boulevard of Broken Themes! Hello! I know that Halloween is a little bit more than a week away, but I’ve decided to participate in this year’s October Challenge! Some of you might remember my LD30 entry, Boulevard of Broken Themes— a game where you traversed your world through games based on potential LD30 themes. It did very well in the Humor department, but I bit off slightly more than I could chew and only finished ~60% of the game’s levels. As a result, I’ve decided to finish up the game in the few months days before November 1st is upon us. A big feature I intended to implement in the original game was a telephone system. If you paid attention during the various levels, you’ll have noticed that there were phone numbers scattered throughout the game. But even if you noticed that you could call 377-3774 to schedule an appointment with Dr. Pepsi, there wasn’t any way to call him up mid-game. But now there’s a phone in the hub that you can use to dial all those numbers! There’s also a skip line that lets you go through levels, and there’s a help line if you’re stuck on a level, as you can see in the screenshot below. I’ve also been working on the game’s earlier levels. If you played the original game, you may remember being frustrated by Level 3 (No One Can See You), where you couldn’t find yourself in the stage. In the updated version, you can see your position by noticing where your body covers up cracks in the background; this makes the level’s difficulty precision platforming rather than remembering where the heck you are. If any of you run Windows and have an interest in playtesting this game, please send me a line at thingo@plippi.com. Hey, have you played our latest Ludum Dare entry? It’s called Tsurara Donna (that’s pronounced sue-RA-ra DOH-nah), and it’s nifty! I’ve only been doing Ludum Dare for about a year, but I’m very proud of this game. Before I start this postmortem up for realsies, a reminder: the song from this game is available on my Bandcamp page, and it’s TOTALLY FREE! Go play it in the background and see if you can guess what song I was shamelessly ripping off when I composed it. I mean, you won’t guess it because you’re presumably not an obsessive Sondheimite like yours truly, but you can certainly make an attempt. I’m digressing here. Alright; Tsurara Donna postmortem. Here we go. 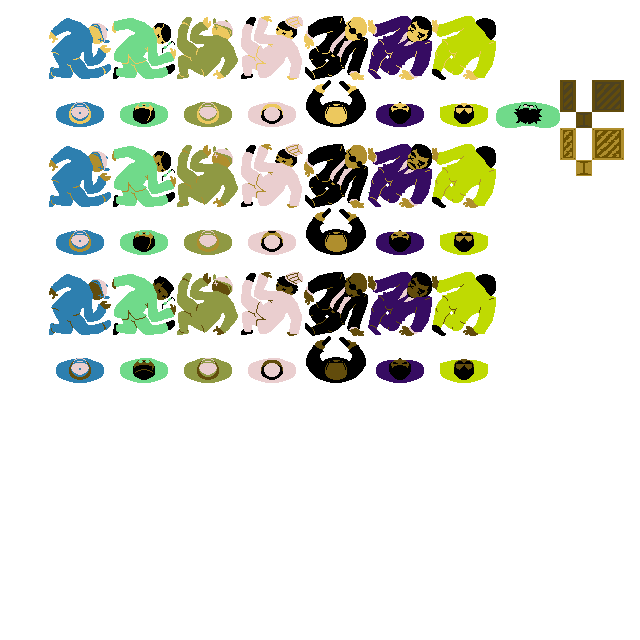 Enemies are programmed in atm; the ones with the little hats are immune to icicles from above, while the ones with the big mouths are immune to icicles from the front. So you need to vary your technique here!